Ragnarok Online - Events - Anniversary Event 2018 - Poring Con! Anniversary Event 2018 - Poring Con! 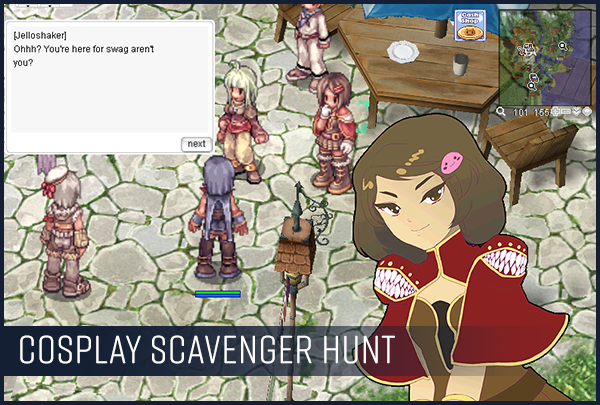 Ragnarok Online celebrates its 15th Anniversary this year, and for the first time ever we're rolling out a very special in-game event called Poring Con! Click on any of the links below to jump to each section! Come one, come all to Poring Con 2018! Located in the beautiful town of Hugel, Poring Con caters to and celebrates adventurers of all stripes. A myriad of fun quests and prizes await you only at Poring Con! Note: Players must be at least Base Level 40 to participate in Poring Con! 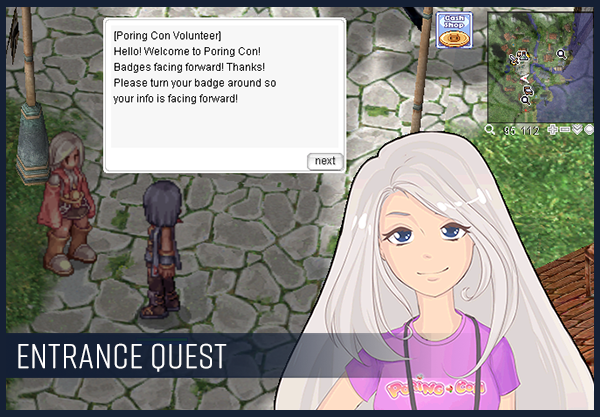 To get into Poring Con, you'll need to have a badge... but all the badges are sold out! Don't worry, there's another way to get in! Speak to the Poring Con Volunteer at the entrance (hugel 93 113) to begin! No convention is complete without free swag, and Astra and Jelloshaker know just how to hook you up with some! Speak to them at (hugel 101 158) learn how to obtain the special Poring Con swagbag! Cosplaying is tough, especially at conventions! Things can go wrong at any minute. 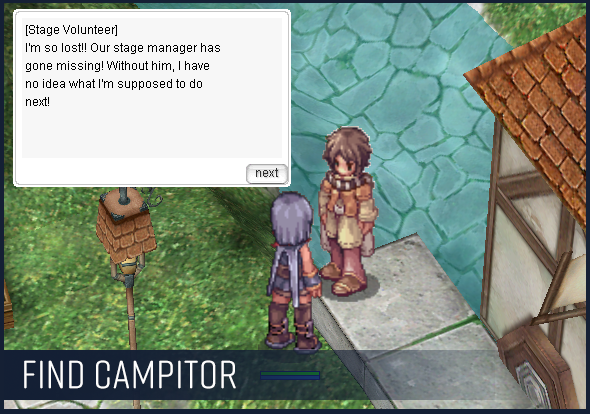 Luckily, adventurers like you are around to help! 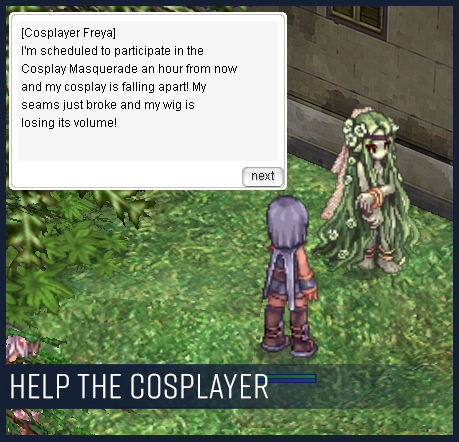 Assist Cosplayer Freya at (hugel 129 130) so she can participate in the cosplay contest! Taking a break from questing? We've got other cool things to do and see around Poring Con! 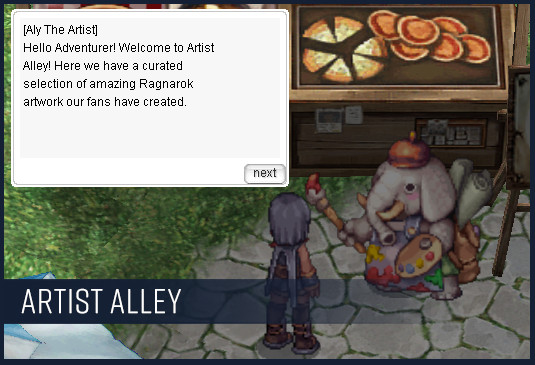 Peruse our fine gallery of art, filled with real artwork created and submitted by real fans and players of Ragnarok Online! Artist Alley is located at (hugel 73 128). If you'd like to submit your own work to be featured in the Poring Con Artist Alley, please do so on our forum thread, Fanart Submission Thread! Find more spectacular artistry on display over at the Monster Cosplay Group! This group of individuals came to Poring Con dressed as their favorite Ragnarok Online monsters. Featuring more artwork from our fans and players! 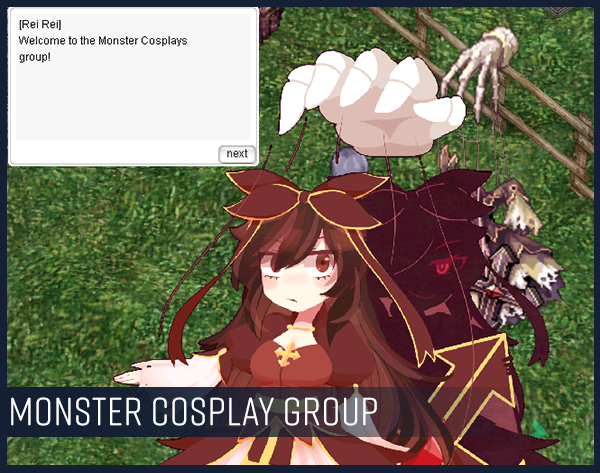 If you'd like to draw your Ragnarok character dressed up as a monster and have it featured amongst the rest of cosplayers in game, please submit an entry to our Cosplay Art Contest on the forums! Deadline is July 1 and there will be prizes, so put your best work forward!